When we lived in Ballarat, my mum-in-law returned from a Queensland holiday with family, raving about how wonderful it was to pick and eat fresh bananas from the backyard for her breakfast. I pondered whether it was possible to grow our own banana tree in Ballarat in a very protected spot, but in the end, rightly gave up on the idea. 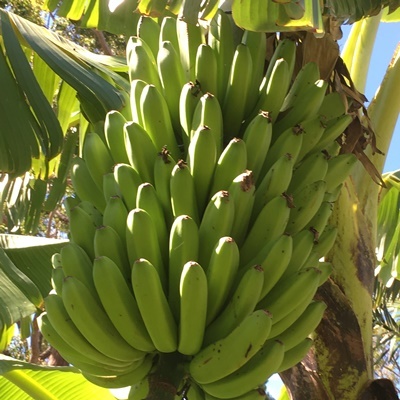 A move to Brisbane re-ignited the desire to enjoy that ‘home grown banana for breakfast’ idea and soon after moving into our garden, started the banana growing with gusto. There are plenty of suggestions for growing bananas using chemical fertilisers, but to get your organic bananas to grow into large, tasty and healthful bananas they do need some special attention. I’ll admit I did go a bit overboard with fertilising at first and grew bananas so large that we could even eat 1 fruit in a sitting, but I’ve scaled back a bit now and they are just right. Who can grow and share banana plants? In July 2016, things changed regarding permits and banana growing. You no longer need to apply for a permit to grow bananas in your garden, as long as the banana plants are sourced from a QBAN approved supplier who grows them from tissue culture. Can you share banana plants with friends? No, you are not permitted to do this. To prevent spread of disease in the industry, sharing bananas from other gardens or across banana growing zones is not allowed. So, you can’t get a plant from a friend’s garden, nor can you buy one from the markets unless it is from a permitted producer. So, I bought our Dwarf Ducasse and Gold Finger bananas from Blue Sky Backyard Bananas before the relaxation, but I’ve heard that certain nurseries now stock banana plants as well. 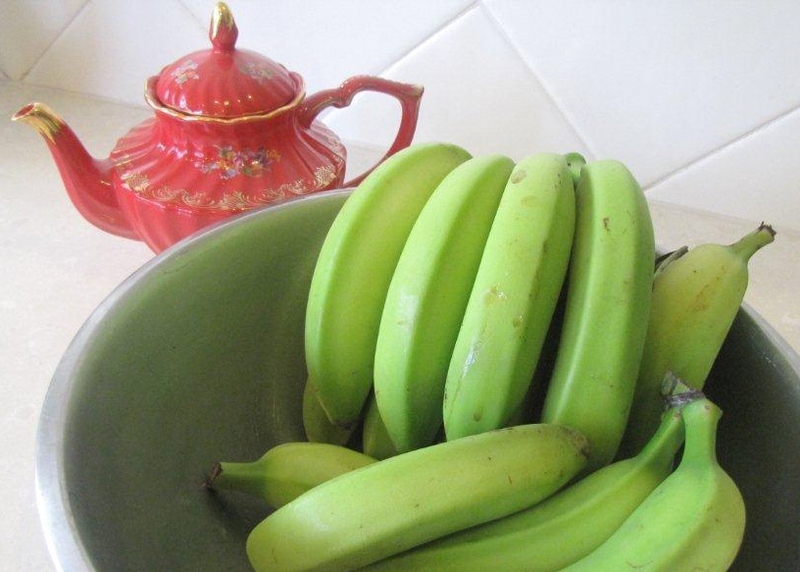 What do bananas love for optimal growth? Warm to hot conditions, and rich, well-drained soil with a pH of about 6.5. Soils are ideally moist in winter and mulched well through the year. Bananas need protection from strong winds. 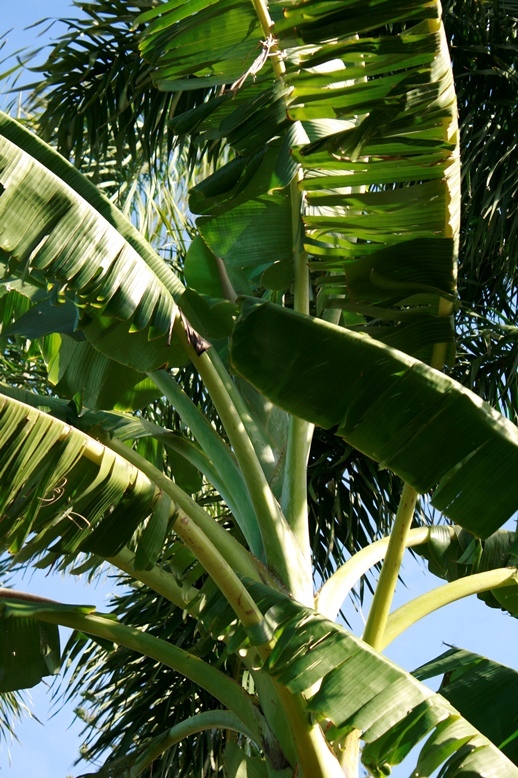 A frost-free area is needed for growing bananas. Many fruit trees take years to produce a harvest, but bananas are much quicker to reward you with fruit. It takes 10-18 months for a new plant to produce its bunch of bananas. 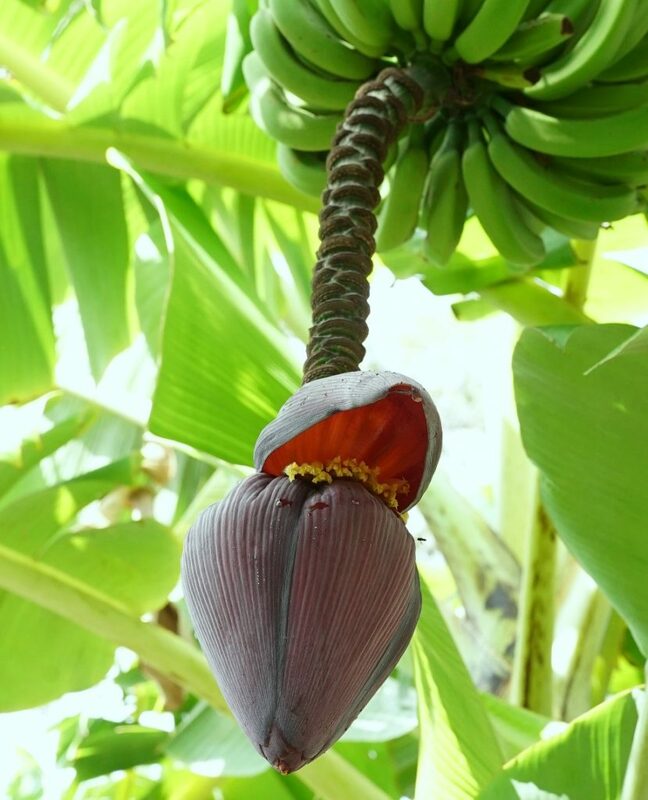 It will develop a flower (banana bell) first. This develops into the bananas. 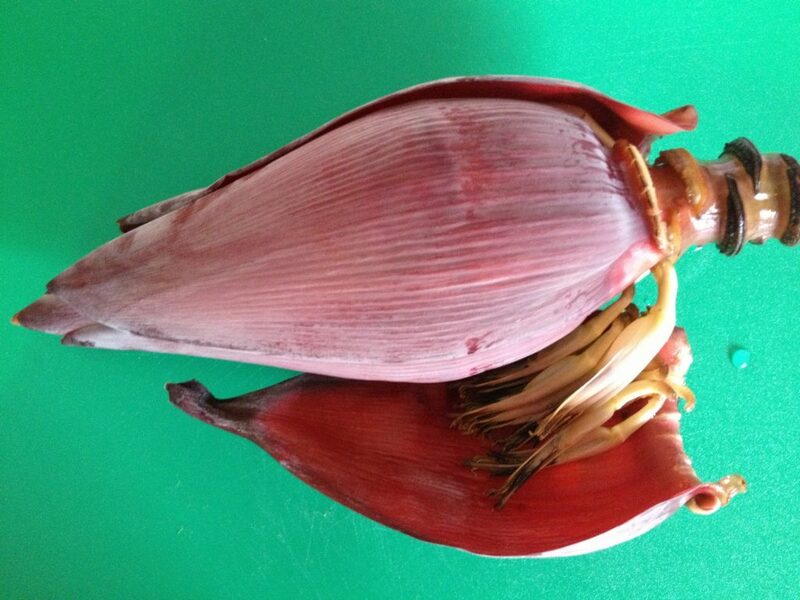 Each stem produces 1 bunch of bananas and you could be getting 20-100 bananas on each fruiting stem. Lots of bananas means an extremely heavy bunch. If the bunch is large and heavy, you may need to prop it up with sticks or an old ladder when in fruit, so the plant is not pulled over by its own weight. Step 1. I suggest starting a banana patch by putting a compost bin in the area you are to grow your plant. When the bin is full and composted down, spread the compost in a 1.5 m circle. If you don’t do this first, apply lots of compost to the are to enrich the soil. The image at right shows a well composted banana zone. Step 2. To the composted area, add aged animal manures and organic potassium (available from me) as well as gypsum 50-100 grams per plant to supply calcium. Water the whole area with Instant Humus or sprinkle on soluble humate granules. These will improve soil fertility and beneficial organisms via increasing humus content. Organic matter, such as compost is very important to increase the beneficial microorganisms in the soil. 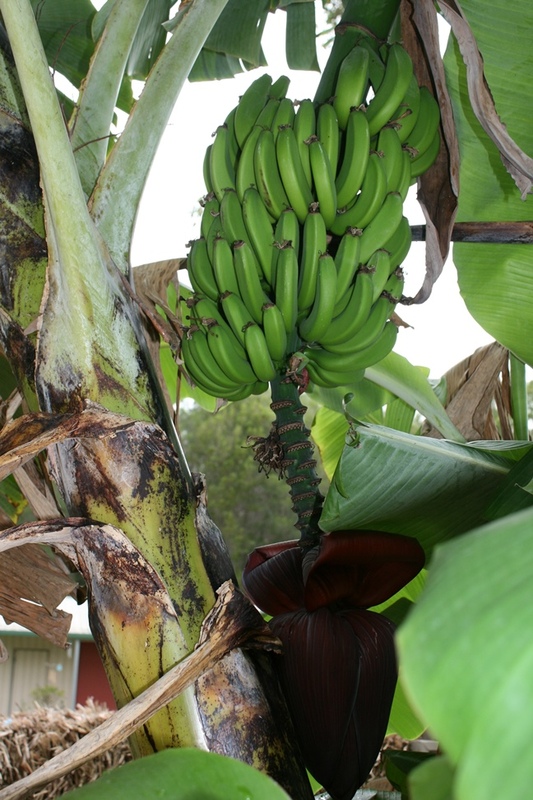 The NSW DPI reports that ‘there is also some evidence to suggest that maintaining a biologically diverse soil through use of various forms of organic matter and maintenance of a well aerated, well structured soil, can help suppress soil-borne banana diseases’. So, if you don’t have any compost, add a bag of good quality compost to the soil per plant. Eg Searles Real Compost or Green Fingers Compost mix. Step 3. Plant your banana 100mm deeper than the plant was in the pot. Keep the soil moist, but not too soggy. Dry soil will cause your banana leaves to burn off on the tips and the banana will fall over before the fruit ripens. Allow 1-2 stems per rhizome to fruit. Cut others away as they grow. Remove all old and dying leaves. 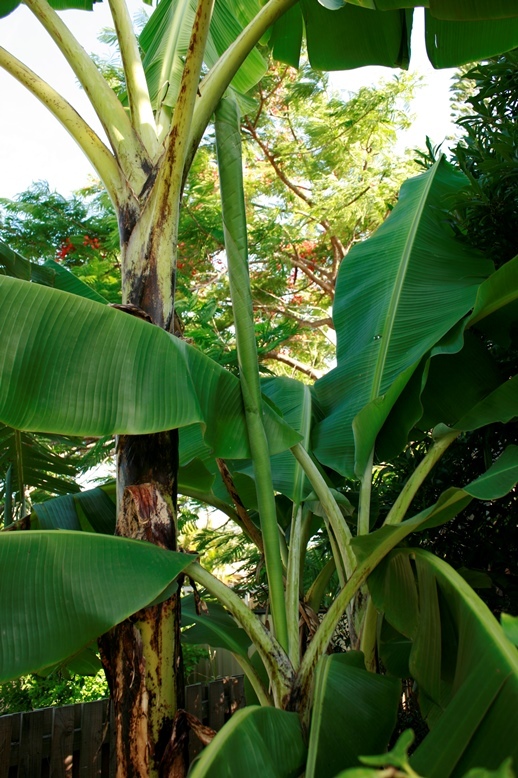 Mulch thickly around the banana plant with straw, compost or cane trash or old banana trunks. You may grow a cover crop of legumes or others such as millet, oats or white clover around the plant, but make sure the soil is still moist underneath. Commercially, chemical fertilisers with an NPK ratio of 10:3:6 are used. For organic bananas, I use a combination of liquid organic fertilisers such as Liggy Max (available from Linda in 1L or 5L bottles), with Organic Xtra pellets and the occasional application of manure from the chook house. In warm weather, fertilise every 4 to 6 weeks. As the plant growth slows in winter, fertilise 8 weekly. 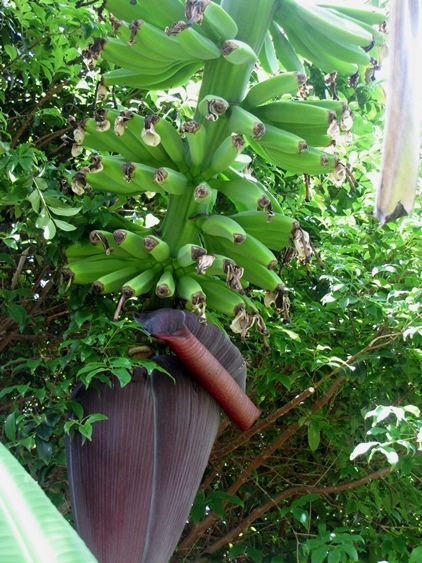 Bananas grown with regular fertilization and irrigation will produce fruit more quickly. At flower/bell emergence, or earlier if you happen to see the ‘flag leaf’ that indicates a new bell is in the early formation stages, apply liquid organic potassium around the tree. I apply a diluted bucketful of liquid potassium per plant. Fit a banana protection bag over your bunch of bananas as they develop. You’ll see the development of the bunch in the images. I wait until all bananas have developed and the ‘corners’ of the fruit have soften out to a round shape. Then it’s time to apply the bag. See the images to the right… the first is too early but the second is when I apply the bag. While the top of the bag is tied around the bunch, you leave the bottom end open. I remove the bell once the bananas are full and round. I use the bell (flower) in salads and curries. The bags are bought at the time you purchase your plants or may be found at Green Harvest Organic Gardening Supplies. Ripen bananas on the stem as they are tastier that way, cutting off 1 hand at a time, starting at the top of the stem. You can also cut the hand off when the fruit is still green as long as the fruit is full, the ribs have rounded off and the space in between the ribs is plump. Cutting down a whole bunch at once is very heavy and may require assistance to carry the weight. Red Spider Mites in the humid, late summer and autumn times are controlled on banana bunches using a dusting of sulphur or a spray of wettable sulphur.